On the west of Sapporo lies the Ishikari bay, which supplies a wealth of quality seafood to the legendary old town of Otaru. Further west from Otaru is the district of Shakotan, a mountainous landscape surrounded by sea on all three sides. These two destination can be easily combined for a day trip from Sapporo. On this trip you can enjoy Uni in Shakotan, Sushi in Otaru, and the beautiful scenery of south western Hokkaido. Its like icing two cakes with one spoon. However, you will probably not have enough space for a cake after a day of indulging on Sushi and Unidon. Shakotan is located about 100 kilometres from Sapporo, on the central part of western Hokkaido. Being next to the Sea of Japan , this small coastal town is one of the well-kept wildlife and natural treasures of western Hokkaido. It boasts of a delicious array of seafood in Hokkaido (click here for the best seafood guide in Hokkaido). During the Meiji era , Shakotan developed as a colossal ground for Herring fishing. These days it attracts a swarm of Sea urchin lovers from June to August. In autumn, during the Salmon spawning season, anglers catch Salmon returning to spawn in the rivers and in winter Cod and its roe makes the prized possessions for the local fishermen. The love of seafood should not be the only reason to visit Shakotan. 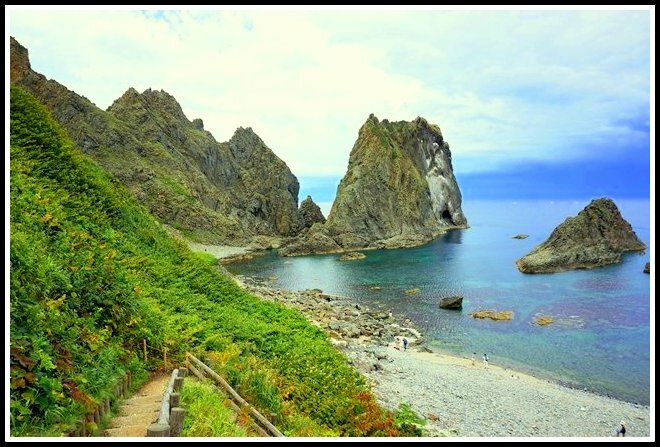 Along the coastline of Shakotan, strange rock formations with the beautiful blue Sea of Japan makes the Shimamui coast, Cape kamui and Cape Ogon a scenic destination. Located in the Irika-Cho of the Shakotan town, Shimamui coast is rated as one of the best beaches in Japan. Being a natural harbour, it is quite popular among anglers and divers. 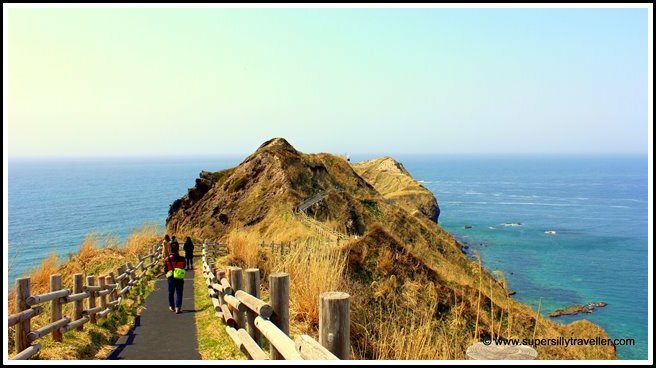 Near the coast, there is a walking trail leading up to the JoroKoiwa rock that stands on the north eastern edge of the Shakotan Peninsula. As per an old legend when Minamoto Yoshitsune , a Samurai left his children and wife to go to Mongolia from the Cape Shakotan, his family went into deep sadness and transformed into rocks . The coast has a free entry and parking spots. It is open for 24 hours except in winter season from December to March. 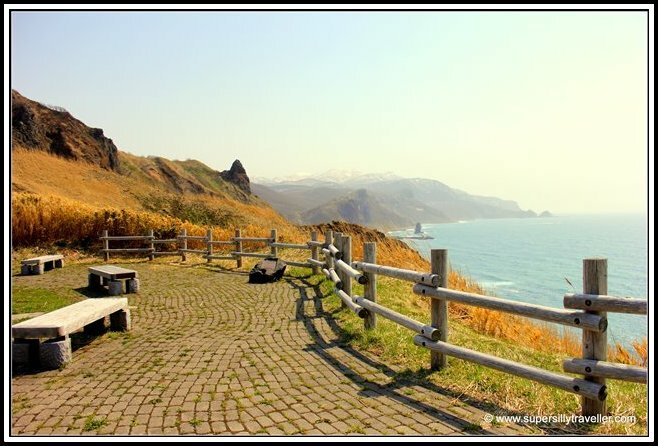 Shakotan’s Kamui Misaki (God’s Peninsula) or Cape Kamui is the one and only ocean park in Hokkaido. It is hard to not to be captivated by the seascape from a height of 80 meters above the sea level. While walking through the 800 meters of Charenka trail, you will feel as you are walking on a dragon’ neck. At the end of the trail, there is a lighthouse built in 1888, which is believed to be the fifth lighthouse lit in Hokkaido. In the golden age , Kamui Misaki was also called as the great wall of Japan. Until the 1850’s, entrance to the cape was forbidden for women due to a curse laid by an Ainu chief’s daughter who was deeply in love with Minamoto Yoshitsune. She jumped into the sea from Kamui Misaki in the agony of being away from him. As per the curse, any woman passes through this cape will not live for long. From mid-June to August beautiful yellow lilies also blooms in the area creating a huge colour contrast with the deep blue sea. The cape has a free parking and entry. Entry timings are April to October – 8:00 am to 6:30 pm, November to December – 8:00 am to 5:00 pm and December to March -10:00 am to 3:30 pm. Cape Ogon is well known for the panoramic views of the Shakotan peninsula during twilight. The Ogon observation deck is about 10 minutes walk from Chasina path and gives a birds eye scene. This place has a free admission but, no parking spots. If you are driving then park at the Shakotan town sightseeing centre . Access to Cape Ogon is closed during winter. A glass bottomed cruise boat also operates between the Bikuni harbour and Biyano point offering an extraordinary picture of the underwater world of the Sea of Japan. Fare is 1,300 JPY for adults. Free parking is available and it is about 5 minutes walk from the Shakotan town sightseeing centre. The cruise does not operates between November to April. After being satisfied with the views of the peninsula, unwind yourself by taking a dip at the Misaki no Yu hot spring. From the outdoor bath at Misaki no Yu, you can see Cape Kamui and the Shakotan peninsula. Opening times are April to October- 10:00 am to 9:00 pm, November to March – 11:00 am to 8:30 pm. Approximately 2 hours from Sapporo using the Sasson Expressway and Yotei national highway. Bus – Catch Hokkaido Chuo bus for Shakotan Kamui from Sapporo. Click here for timetable and fares. From Otaru, Otarueki-mae bus terminal – Catch Hokkaido Chuo bus Shakotan line to Kamui misaki (Approximately 2 hours 20 minutes) . You can also make a reservation for the scenic Cape Shakotan Tour operated by Chuo Bus. Click here for details. As there are no train lines between Shakotan and the rest of Hokkaido, catching a bus from Otaru, Sapporo or Yoichi station is a better option. Known as the wall street of the North or the sea entrance of Hokkaido, Otaru is an old port town which is excellent for a stop over on your way back from Shakotan. 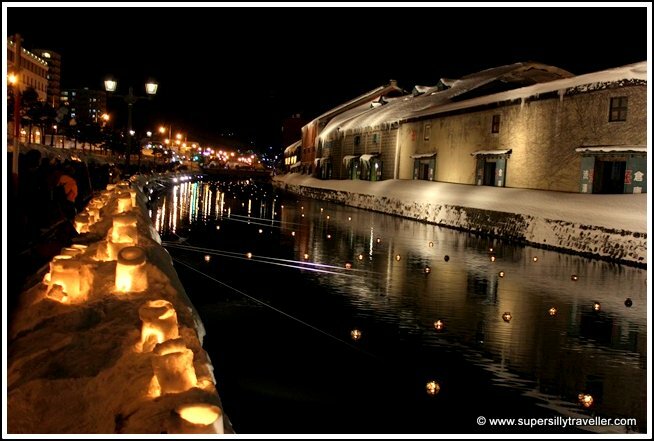 Otaru is known for its historical buildings and the Otaru canal, freshest quality of sushi and sashimi and the lantern festival (winter). Sakaimachi street in Otaru is a popular area among the tourists for shopping. While strolling down the street, visit the Kitaichi Glass factory, Venetian glasswork museum, and the music box museum. After shopping, enjoy some fresh sushi for dinner. There are many good sushi restaurants in Otaru where you can just walk in. If you are not looking to go for the expensive tourist oriented places I would recommend this restaurant (bookings may be required in busy season). 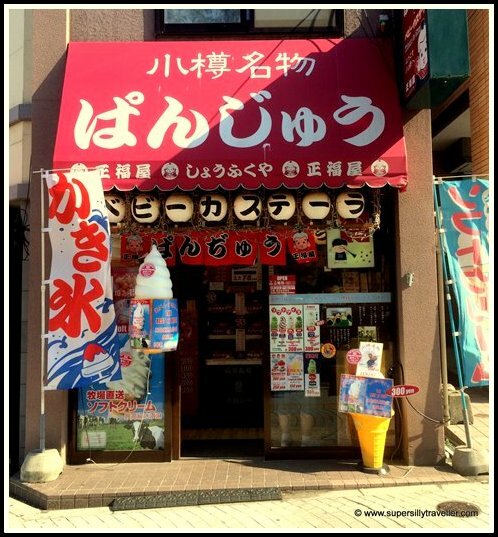 For desserts try some creamy and refreshing Hokkaido Soft cream at Panjyu (ぱんじゅう) about 4 minutes by walk from the Otaru station. Click here for directions. You can also go to the Nikka Whiskey Yoichi distillery in Yoichi, if you have time to spare. This distillery is a renowned cultural property of Japan. If you like whisky, then you should try the unlimited free samples of Single Malt Yoichi and other brands of Nikka. In autumn, you can see Salmons swimming upriver at the Yoichi river. The entry and tour to the factory is free. It is closed for public from December 25th to January 7th every year. Approximately 40 minutes from Sapporo. Click here for directions. Train: 30 minutes by Rapid service or 45 minutes using the local JR train towards JR Hakodate Main line. Fare is 640 JPY. Bus: There are frequent Hokkaido Chuo buses and JR Hokkaido buses that run between Sapporo and Otaru from the Sapporo Station bus terminal. You can also book day tours with Chuo bus. Click here for details. Drive: About 60 kilometres from Sapporo. 1 hour 15 minutes in car. Click here for directions. Train : Yoichi Station is 1 hour from Sapporo ( will need a transfer at Otaru), or 25 minutes ( hourly departure) from Otaru using the local trains on the JR Hakodate line. Fares are 1070 Yen or 360 yen respectively. Nikka Whiskey factory is about 5 minutes walk from the station. For another one day trip from Sapporo to Noboribetsu and Shiraoi Ainu town check out this link. Hello!!! Loving your blog…very informative and beautiful accompanying photos. I have sent you an email to inquire more about Shakotan. I hope to hear from you soon. Just responded to your email. let me know if you have any more questions. Can i know what is the last train that depart from Otaru back to Sapporo as i plan to see the night view in the canal? The last available train from Otaru station to Sapporo is at 11:10 pm. Hey! Found your blog while looking for tips for Hokkaido. Planning to do a daytrip to Otaru & Shakotan and would like to visit Cape Kamui but it seems there is no buses during winter time there. Should I just stick to Otaru in this case? Yes, I suggest sticking to Otaru and covering Yoichi Nikka Whisky if you like. Shakotan is at its best in summer, winter is usually very cold and windy at the Cape. Hi, we will be driving to Otaru mid Dec. After reading your blog, we are keen to check out the Shakotan Peninsula. Would you know the driving conditions if we travel Otaru – Shakotan (visiting the capes along the way-Niseko? Driving conditions in mid- December shouldn’t be too bad as snow storms are quite rare around that time. However, it is certainly best to check on the conditions before you leave. Thank you for your kind words 🙂 I am sure, you will have a wonderful time in Hokkaido. Thanks 🙂 Well, its autumn in Sapporo now. How about Noboribetsu, Jozankei or Sounkyo? Cape Kamui will be nice, but I suppose it might be a bit windy and chilly. That sounds doable to me. Just take into account the travelling time. I am planning a trip next May to Sapporo. Please help me to plan the 7 days itinerary starting from and ending in Sapporo. We don’t travel so we need the public transportation. Any reasonably priced onsen hotel in the area with easy access from Sapporo. Thanks for your comment. I can give you some simple suggestions. However, I charge a fee to plan a complete itinerary. Please send me an email at contact@supersillytraveller.com, if you would like to discuss further.